DOT is moving ahead with a new plaza and safety improvements at the intersection of Myrtle Avenue, Wyckoff Avenue, and Palmetto Street on the border of Brooklyn and Queens, the Ridgewood Times reports, with work slated to start today. The project got a thumbs up from one of the neighboring community boards and a thumbs down from the other but has enjoyed strong support from local Council Member Antonio Reynoso throughout the process. The Myrtle-Wyckoff transit hub is served by two subway lines and six bus routes and sees much more foot traffic than auto traffic. It’s also a six-spoke intersection with many turning conflicts. Motorists have killed three people there since 2009. In 2013, a turning MTA bus driver killed Ella Bandes in a crosswalk. DOT’s subsequent adjustments to reduce conflicts did not prevent another turning MTA bus driver from killing Edgar Torres the following year. Bandes’s parents, Judy Kottick and Ken Bandes, have repeatedly called on DOT to take stronger steps to save lives. 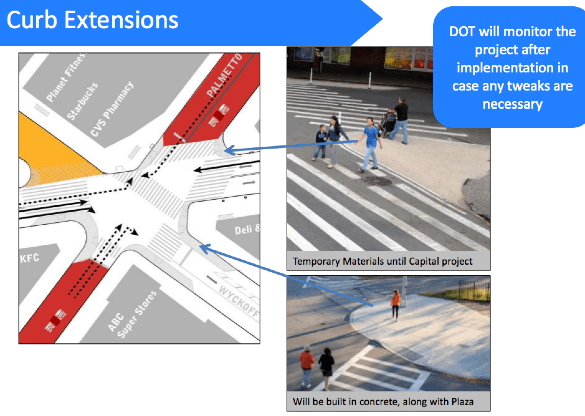 DOT’s redesign will convert one block of Wyckoff, between Myrtle and Gates Avenue, to a car-free space, making it safer for people to walk between the Myrtle-Wyckoff subway station and the Ridgewood Bus Terminal on Palmetto [PDF]. In addition to installing the plaza, DOT will extend sidewalks at corners, shortening crossing distances and slowing motorist turns. The potential for vehicle movements to conflict with pedestrian movements will be greatly reduced. A one-day tryout of the plaza concept in April was a success. Queens Community Board 5 overwhelmingly endorsed the plaza proposal, but Brooklyn Community Board 4 voted against it. Local City Council Member Antonio Reynoso urged DOT to install the plaza despite CB 4’s objections. It’s good to see DOT again putting New Yorkers’ safety ahead of community board complaints. The Ridgewood Times says the plaza is expected to be “fully operational” in October. Is the bus lane getting implemented too?